Rapid increases in network traffic volumes, security threats and application complexity all underscore the importance for lossless data capture, analysis and storage to provide crucial raw data for post event analysis and remediation. 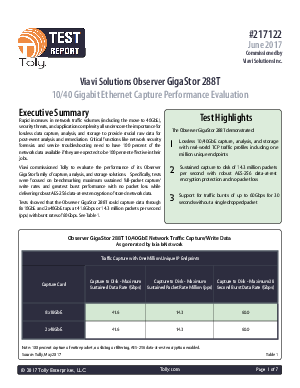 Viavi commissioned Tolly to evaluate the performance of its Observer GigaStor family of capture, analysis, and storage solutions. Specifically the tests that focuses on bench marking maximum sustained full packet capture/write rates and greatest burst performance with no packet loss while delivered robust encryption of stored network data.